[Recaps] Princess Weiyoung 錦綉未央 – Ep 1 – PINKKLOVER. HO HO HO. Princess Weiyoung is finally here! Just a warning, these episodes are quite fast-paced which has its pros and cons (I’ll explain them in a minute). Before I begin the recaps, can I just say how amazing the songs are? I’m so going to buy the OST as soon as I finish this. Ok, Ep 1, let’s go. This episode begins with stunning shots of the harsh winter and we see rows of monks praying outside for the baby’s safe arrival. This baby is Xin’er (Weiyoung) and as soon as she was born, the sun suddenly comes out and the scene seems much more happier. Straightaway, Xin’er’s father and grandmother went to have a look at the baby with bright faces. What a happy scene! 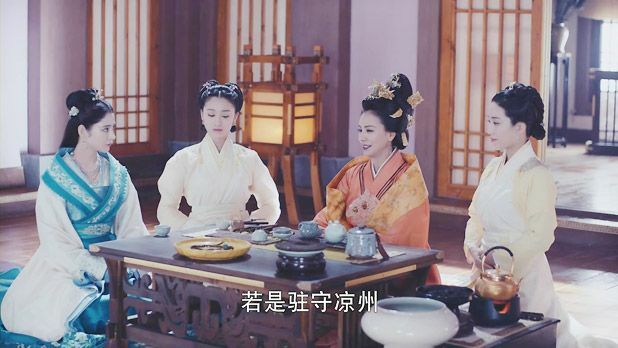 Too bad the happiness only lasts for a few seconds as the father was immediately forced to leave his palace, leaving the grandmother and Xin’er to stay as hostages. Suddenly, we get shots of Xin’er who’s already a young adult! And like usual stories, she’s introduced as a naughty, tomboyish girl who dresses like a man and walks with swagger. Then the scene switches to Li Changle and her mother as they talk with hidden meaning. Later, we understand that they were discussing their plot on assassinating Xin’er’s father and framing him for going against the emperor. Then we see Xin’er again, buying lanterns to celebrate her grandmother’s birthday. Little does she know that there’s something wrong with the lanterns. Amidst the exchange, the lantern accident caught fire and a few of them began to fly away. Xin’er immediately went to catch them with the help of our main lead, Tuo Ba Jun. After a short argument about him grabbing her waist, and him suspecting she’s a girl, Xin’er and her bodyguard leaves the place ‘swaggerly’ to go back home and prepare for the surprise. Then, we see a troop of soldiers all shouting “kill, kill”. They are fronted by General Ling who’s going to assassinate Hexi’s King (Xin’er’s dad). Soon we get switched to Hexi’s King arrival back to his palace to celebrate his mother’s birthday. The happy family reunion between the mother and son and Xin’er was heartwarming as they haven’t seen each other since Xin’er was born. Then, it’s nighttime and this is when trouble will take place. We hear the drums getting louder and louder which also signifies that something major will happen. But, before trouble begins, we have a bittersweet moment of Xin’er gifting her grandmother with a beautiful scene of lanterns flying up. Oh no! It turns out the lanterns were carrying poison as General Li’s soldiers immediately shoot arrows at it, releasing poison gas everywhere. Oh, so this was their plan. Selling poisoned lanterns to Xin’er so that they could frame the Hexi King for this. tsktsktsk. We see the Hexi King murdered as Xin’er and her grandma looks on from the background, crying and mortified. Afterwards, General Li asks his younger cousin why he didn’t kill Xin’er when he saw them too and went on to say that there is a special jade on her body & believes that no one except Chang Le can match this jade. So, they passed on the order to kill all the royal family. Meanwhile, Xin’er and her grandma escape with their bodyguards but suddenly the grandma says, “You must go on without me. I will slow you guys. No matter what you must continue to live on as the last bloodline of the Imperial family.” So the granny sacrifices her life for her granddaughter as she confronts the generals bravely. Later, we see Xin’er’s bodyguard disguised as Xin’er in attempt to divert their attention and she too unfortunately dies. Then we get the scene of the person who witnessed everything that has happened as he quickly notes down everything. Unfortunately, he too gets killed but not before he hid the letter in a jug. Lastly, we get a glimpse of Tuo Ba Yu (Vanness Wu) who wants to kill all the Liang citizens and deny them entry into the city. However, Tuo Ba Jun quickly grabs the plaque to command the soldiers to open the city gates and saves the civilians. Like I said, fast paced but loved the intensity of it! Get ready for ep 2 recap!